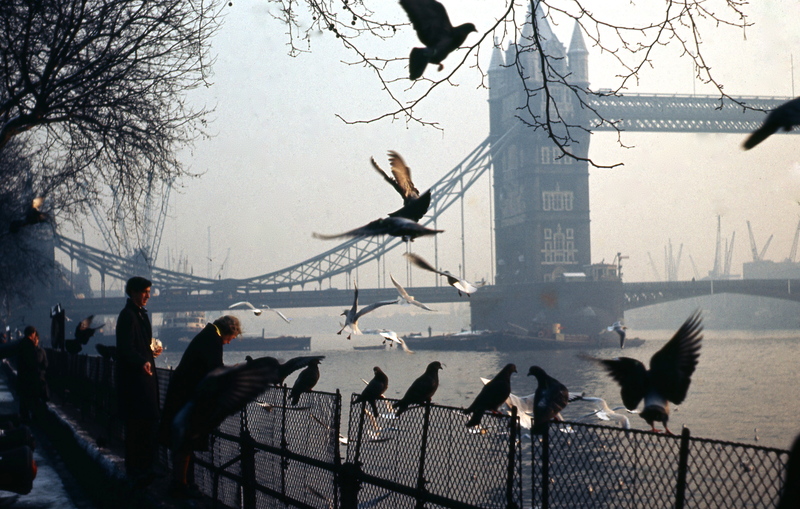 In January 1964 I took four colour slide photographs of birds being fed at the Tower of London. The best of these has been lost. I had used it to produce a calendar for Mum a year or so later. Sadly, of the twelve pictures selected for that present, this is the only one that has sunk without trace. Two others are just not good enough for my eye which is far more discerning now than it was then. If you have just one or two of something in a collection, maybe you are more likely to retain what would be better thrown away. If you have thousands amassed over fifty years, you don’t mind creating a few gaps. These two are now in the bin. This is the one that, with a considerable amount of retouching, survived for my posterity collection. It is feeding time for the gulls and pigeons that no doubt still gather to snap up the offerings of those generous souls giving up their lunch hours to line the railings and toss bread for the birds as yesterday’s Ibsley woman tossed carrots for the ponies. I fondly speculate that I still occasionally photograph descendants of these very avian symbols of London and The River Thames. Well, I am given to the occasional romantic thought. The woman nearest the camera was a daily visitor. The lost picture contains her outstretched arm and shower of airborne crumbs glinting in the low winter sunshine. I see it still. A perhaps less romantic observation is that the dockers whose cranes, so prevalent in 1964, no longer line the shores, are long gone from the scene. Five years after this photograph was taken London Docks were finally closed to shipping and sold to the London Borough of Tower Hamlets, who set about redeveloping them for residential purposes. Further vast improvements to the area were, of course, undertaken for the 2012 London Olympics. Today’s weather did not improve in the afternoon, although the storms were not as violent as they had been yesterday. We drove Flo through rain, hailstones, and darkening skies, to blink through drops running down the car windows at the home in Downton we hope to buy. In mid-afternoon it seemed like nightfall to the east whilst a golden sun pierced clouds to the west. I could even see small patches of blue sky in Jackie’s wing mirror. This dramatic contrast was even more apparent on the beach at Milford on Sea. We went on there for Flo to give Scooby a run around on the coastal footpaths, as the choppy waves crashed on the granite rocks below the cliffs. Turner would have painted the nearer clouds to our right as the sun slowly subsided in a clear blue sky. A young man stood contemplating the scene. At the same time the lighthouse light warning of The Needles, on our left, flashed away, clearly visible against a patch of open sky beneath the untinged blanket of cloud. You will need to zoom in on the picture to see what we could see. I found it amazing that looking out across the same stretch of water, simply by changing one’s angle of view, one was seeing such differently hued cloudscapes. 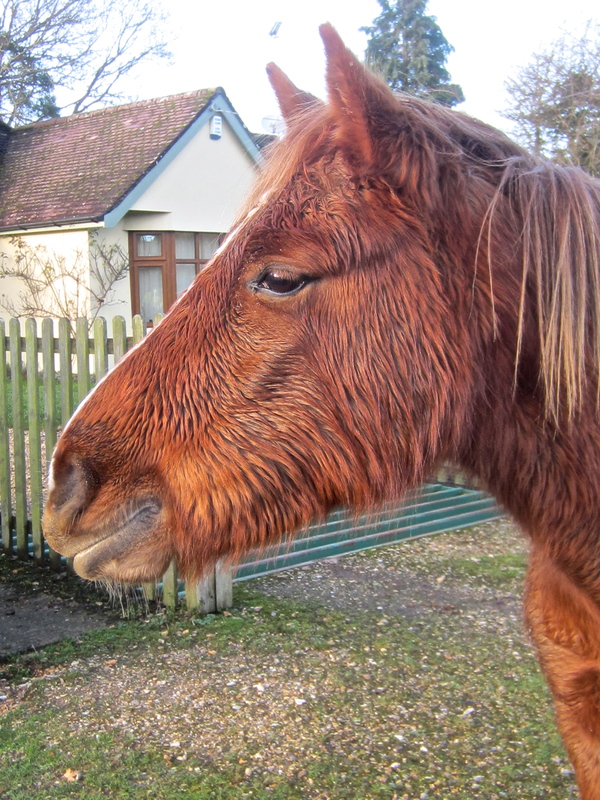 Scooby trotted up and down for a bit, whilst Flo gave me the benefit of her artistic direction. It was cold, so we didn’t stay outside long enough for Jackie to get into her programme on the car radio. We then showed Flo the town and shopped in the Old Milton Tesco. Yesterday Becky gave me another computer lesson, this time in tagging. She showed me how to tag my posts and explained the significance of doing so. That, therefore, is another editing job for me. I made a start on the task this morning. A violent storm that had raged throughout the night and morning gave way to a calm, springlike afternoon. This was perfect for an art assignment Flo had hoped to complete. The one problem was that the task was to photograph horses in action. 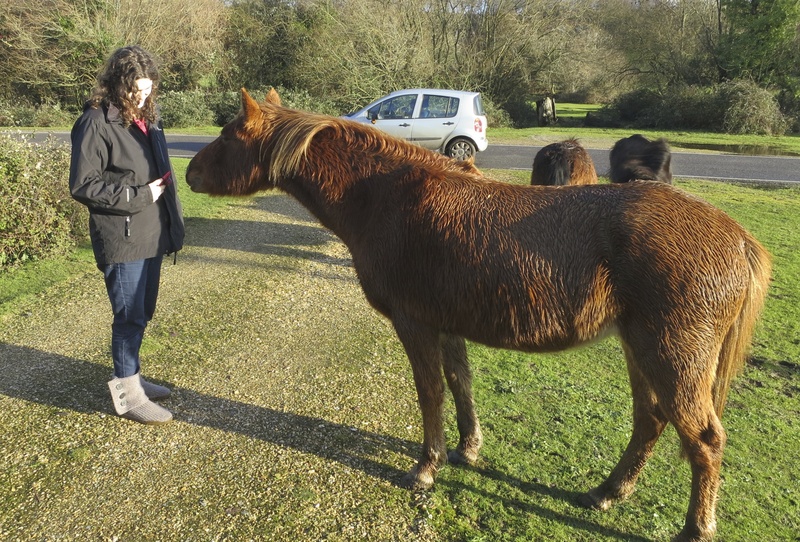 And, as my readers will know, New Forest ponies are not prone to activity. Mostly they are at least upright, but occasionally they are simply prone. We thought an expedition to the north of the forest would perhaps offer possibilities for the occasional evidence of movement. 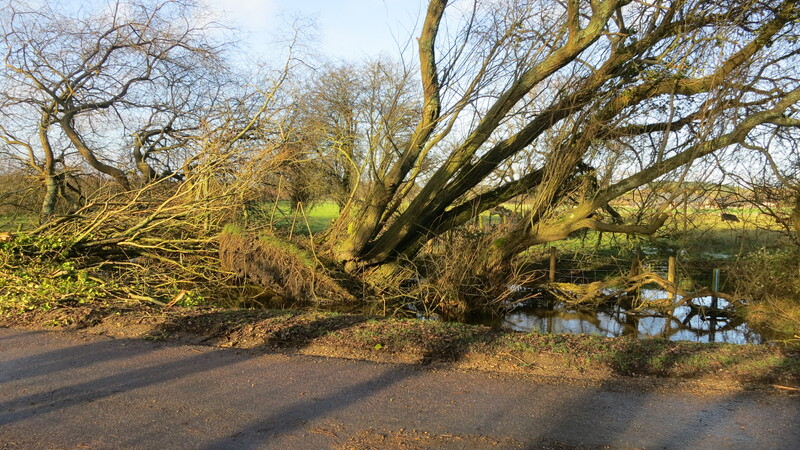 More trees had been uprooted during the night. Those that had been on the roads had been cleared away. Others lay where they fell. What really gave Jackie a white knuckle drive was the amount of water across the concrete and tarmac. The fords were all awash with fast flowing water, as were the ditches. 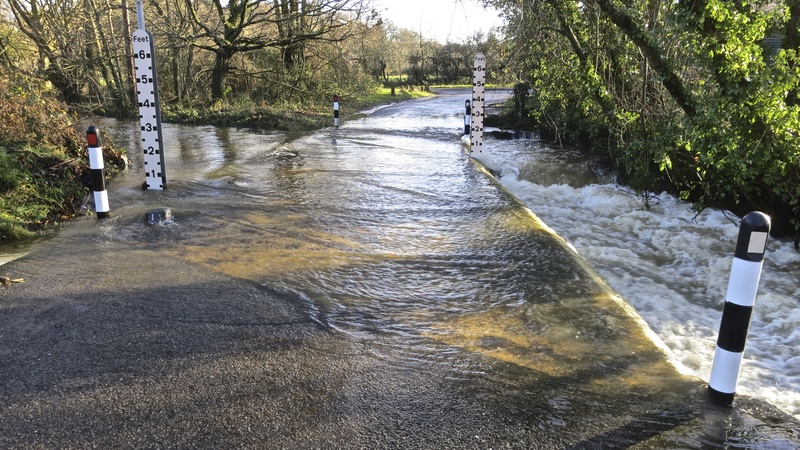 Sometimes, as on one stretch on the outskirts of Ringwood that I had happily walked through quite recently, the road was flooded. At this particular point our chauffeuse stopped altogether, thinking she would have to turn back. 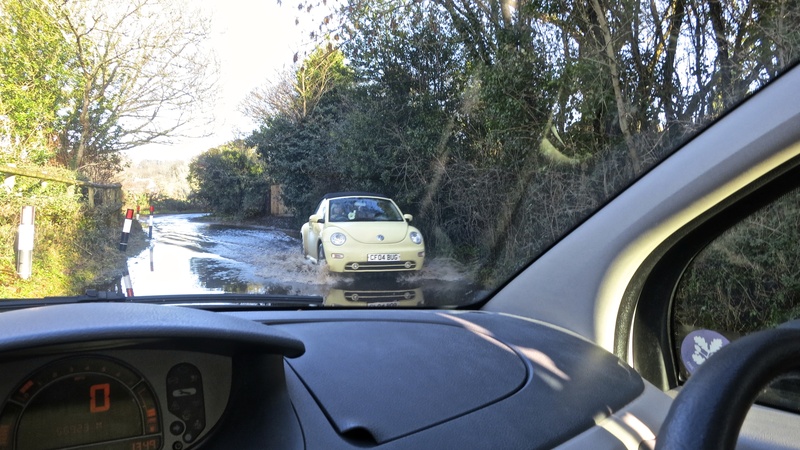 An oncoming car sprayed its way through the water, giving her the confidence to try it, which she did successfully. The brakes had to be tested after each ford encounter. 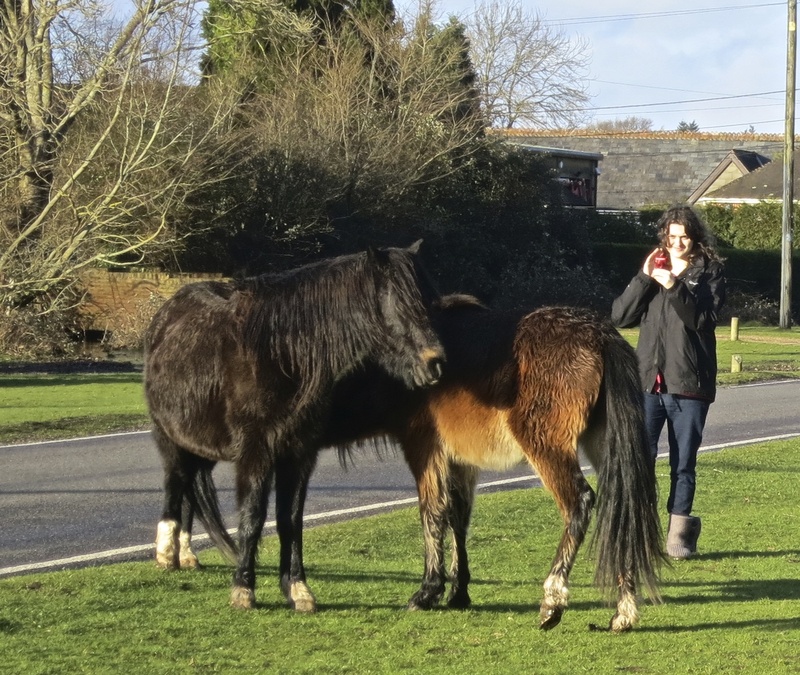 It was the perhaps unlikely village of Ibsley that provided the photo opportunity that we sought. 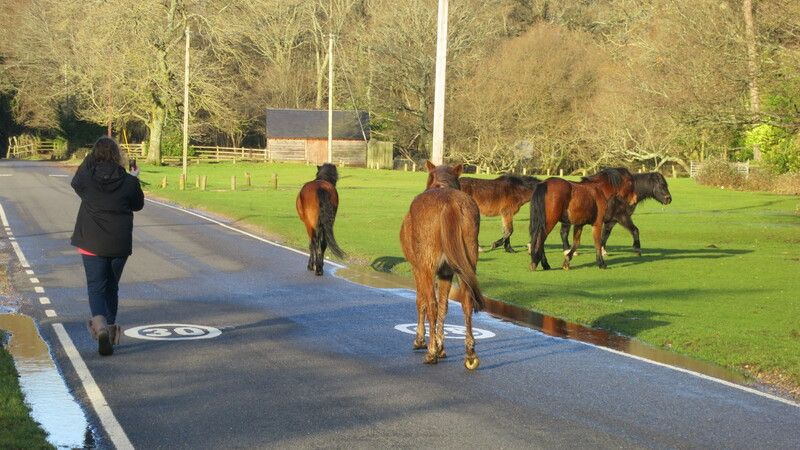 As we drove slowly through it, having just crossed the ford, three ponies made a dash for a waterlogged spot in front of the cattle grid to a residential garden. Small orange showers flashed in the sunlight, and the animals leapt into action. The woman who lived in the house had just tossed a supply of carrots onto a patch of dry land. These were soon devoured and hopeful nostrils quivered in the donor’s direction. No more carrots being forthcoming, Flo and my cameras were mistaken for tasty morsels and they and we were silently nuzzled. It was to be Scooby who really set the cat among the pigeons. Of course he remained in the car with Jackie, but he became a wee bit excited at the sight of such huge potential dinners wandering about. Indeed, his glutinous mucus will probably never come off my passenger seat window. 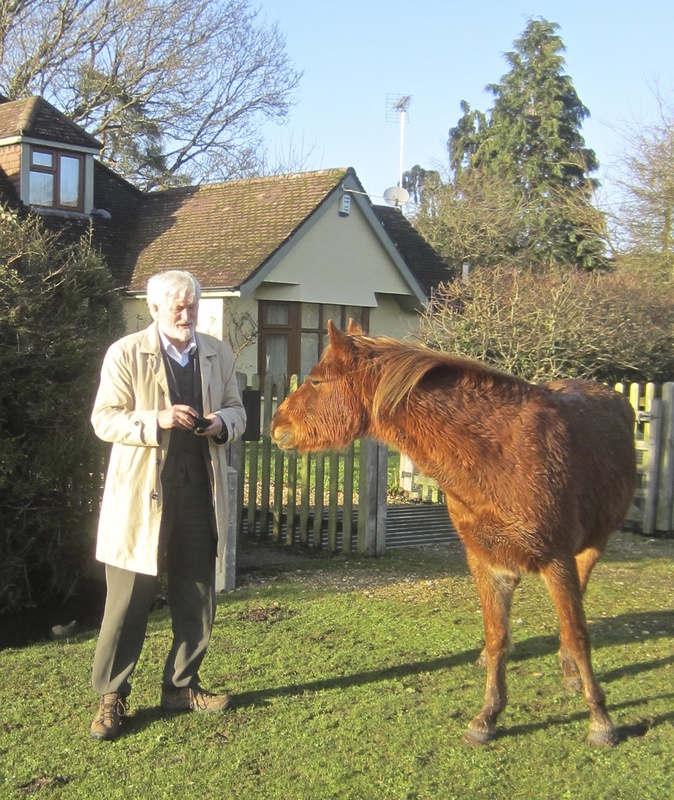 His barking had the effect of a summons on all the ponies in the vicinity. Our car was soon surrounded, causing a log-jam in the traffic. Our granddaughter and I had as much fun photographing each other photographing our subjects as simply shooting the animals. 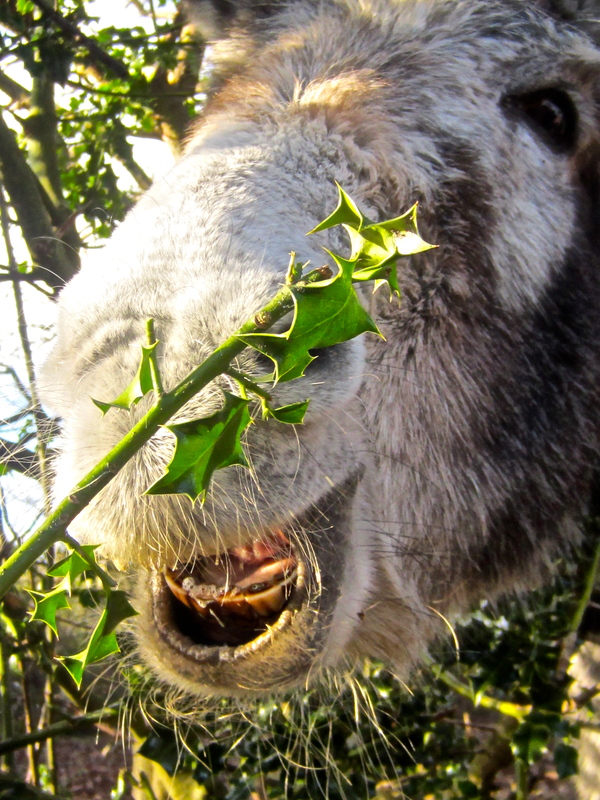 When we arrived at Hyde, we were awarded a bonus of a couple of donkeys particularly interested in holly leaves. 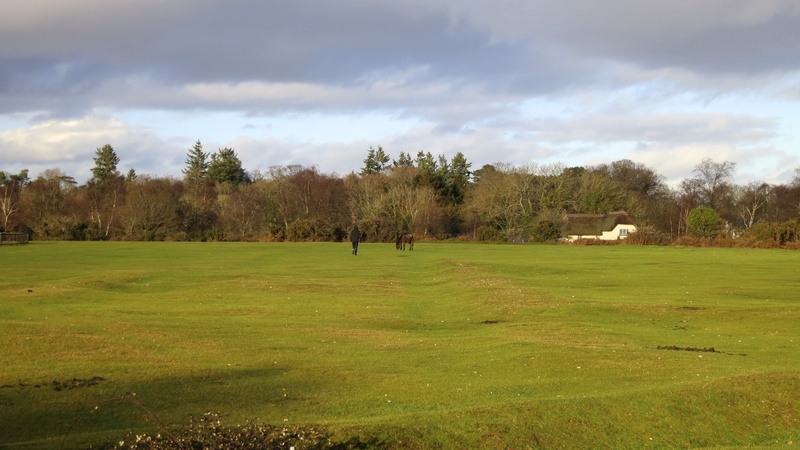 After a session with them, Flo strode across the large expanse of green, to picture another pony, and in the process missed a horse and rider. But that wasn’t really a subject she needed. She had already photographed a sublime pony’s head and a delightful set of donkey choppers. We dined this evening on Jackie’s chicken jalfrezi and savoury rice which was as delicious as ever. Flo’s variant was boiled egg korma. My beverage was Kingfisher and Jackie’s was Peroni. 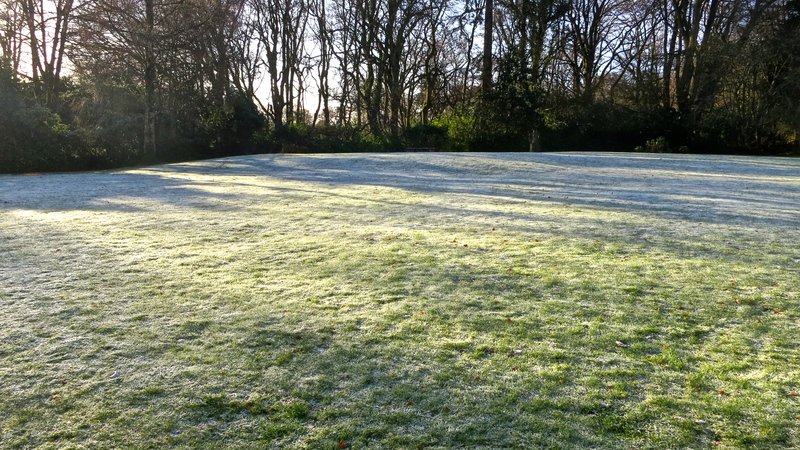 Glittering white frost coated the lawn this beautiful, cold, blue-sky morning as Jackie drove us to West Totton’s Tesco Express to buy a few essentials, like bread and potatoes. I had intended to walk back from the Minstead turn off on the A337. However, where the sun had not reached the road surfaces they were so slippery that I thought better of it. Leaving Flo and Scooby behind, Jackie drove Becky, Ian and me to Downton to gaze at the outside of The Old Post House and have a drink in The Royal Oak. 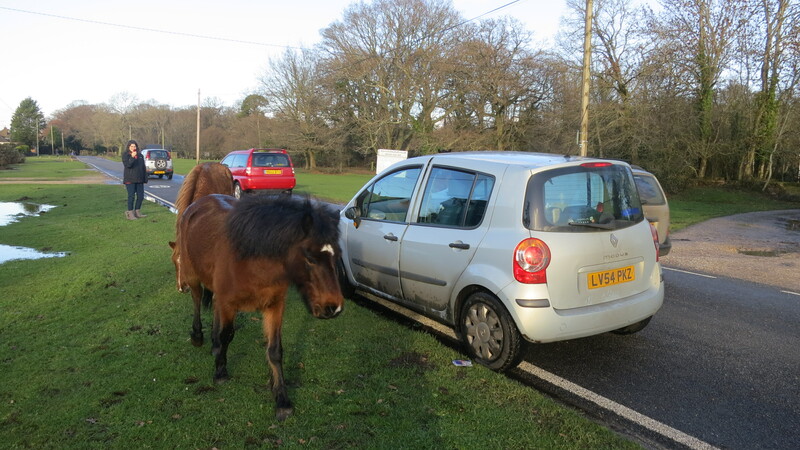 Then leaving the rest of us in the pub car park to ‘get a round in’ she went off to New Milton to make a purchase. As I didn’t expect to be outside for too long on this still rather cold, albeit glorious, day I hadn’t worn a coat. It was then I realised that this was an error. The pub was closed. And Jackie had left before we realised it. Oh well, she had resisted the temptation to investigate all the half-price meats in Tesco’s and therefore wasn’t gone too long. Ian was particularly pleased because we had driven past his mother’s old home, just a few hundred yards from the house we hope to buy. It had brought back many fond memories for him. We didn’t search out another pub, and returned via Bolderwood, a magnificent forest route that looked splendid this early sunny Sunday afternoon. What we noticed was that here again many large trees that seemed to have incongruously shallow roots had fallen recently. 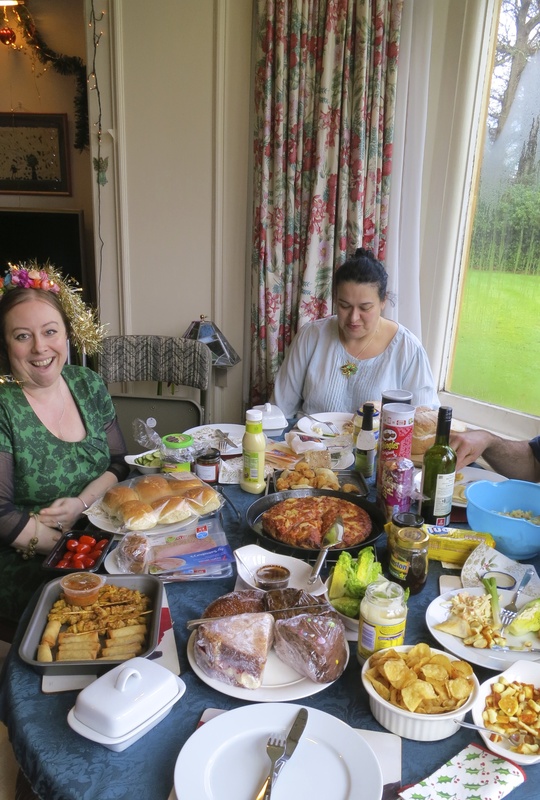 We had a late, filling, lunch of turkey and vegetable stoup, before Becky and Ian returned to Emsworth in the early evening. Flo and Scooby stayed with Jackie and me. During the late 1950s, as I have mentioned before, I used to sit and draw and paint alongside Kenneth Lovell an artist who, among other works, illustrated Hulme Beaman’s Toytown series of children’s books. 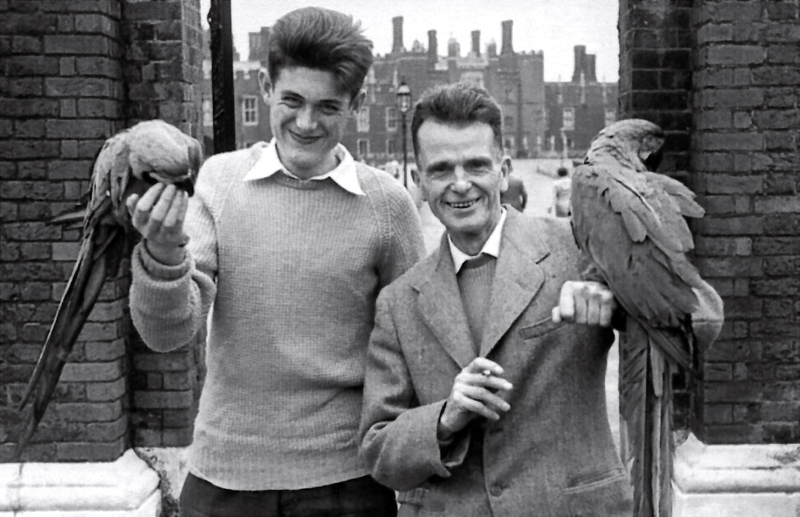 It is Ken who, having been perfectly happy to patronise a man with an impressive camera and two equally striking parrots, stands beside me outside Hampton Court in about 1958 in ‘through the ages’ photograph number 39. My drawing with the artist was a weekly event that had come into being as a result of Mum, through a mutual friend, having been introduced to Ken and showing him my nascent cartoon work ‘Toad in the Wild West’. I never did progress beyond my first display board of this tale, but I spent many happy and fruitful hours with my friend from whom I learned all I ever did directly from anyone about drawing. For several years we would spend Sunday afternoons working and then have tea consisting of delicious sandwiches and a fruit salad. 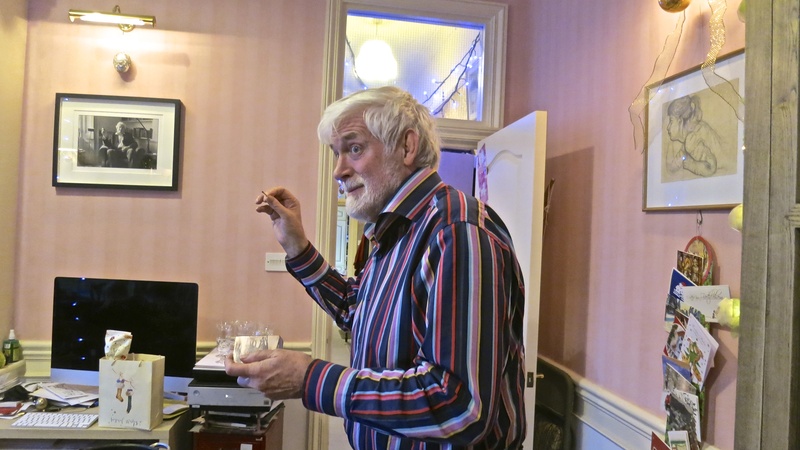 We were occasionally joined for the meal by Ken’s live-in friend George Edwards, an opera singer. The assistance I gave Ken on one of the Toytown books was a tracing exercise. Nothing to do with ancestry, this was a method of transferring draft drawings onto display boards for the production of the finished work for publication. Ken would illustrate the stories of Larry the Lamb, Mr Grouser, and many others in bold colour with firm outlines in pen. The final drafts of those in which I had a hand were handed to me drawn on good quality fashion plate board. I would trace these onto fresh tracing paper. Taking a soft pencil, I would cover the backs of these sheets with graphite, then place the paper face up on the finishing board fixing it firmly in position with a tape something like Sellotape. 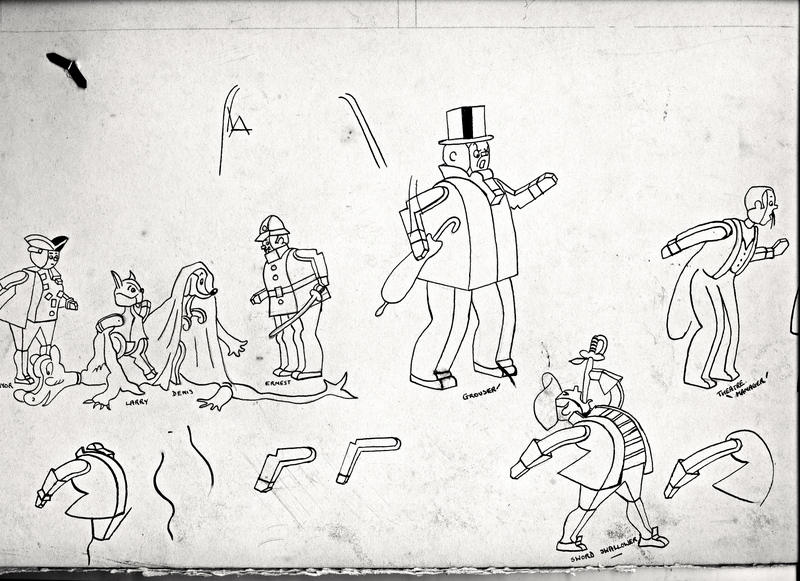 I then took a sharp, harder, pencil and traced over my work, leaving a print on the board. The artist would ink over the prints and then apply the colour. I felt very proud to have been entrusted with this task. some of my own efforts at reproducing Ken’s characters. I had done these to satisfy us both that I was up to making adequate tracings. Sandwiches were all we desired for our evening meal. Mine were one of delicious ham and mustard and another of tasty pate. ‘The Matrix’, last night’s television film, was beyond me. I lasted nearly two hours before giving up and going to bed. Two others of the assembled company had had seven attempts between them to understand it, and never finished it. Becky managed to see it through this time. 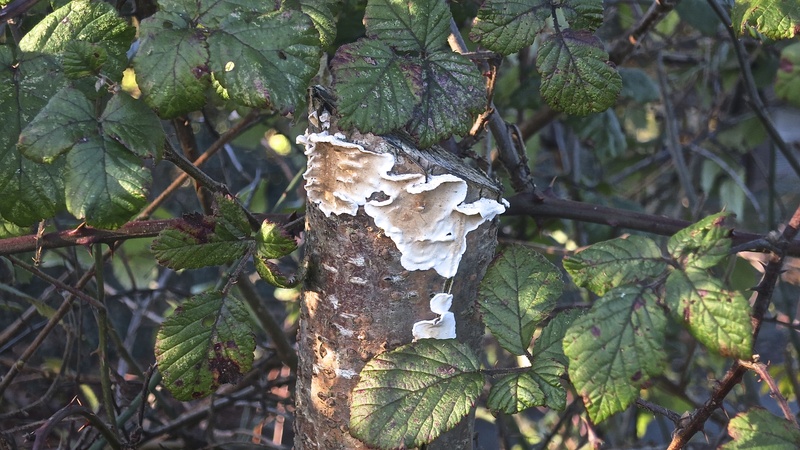 On this beautiful, sunny morning, balmy enough to hoodwink the birds into thinking winter had been skipped this year, I took yesterday’s walk alone, and in an anticlockwise direction. 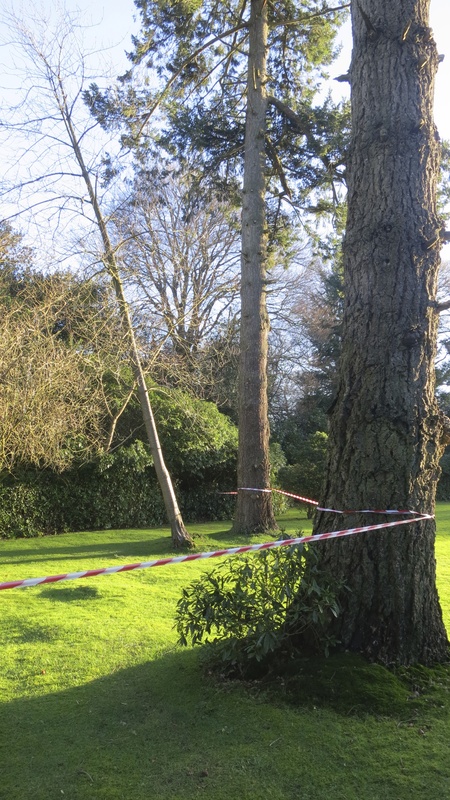 The recent gales have felled or shattered more of the forest trees, and, indeed, one in our garden is looking precarious enough to have been taped off. Alongside perhaps the most dangerously narrow and winding section of the road through the village a gravelled footpath is separated from the tarmac by a living fence. 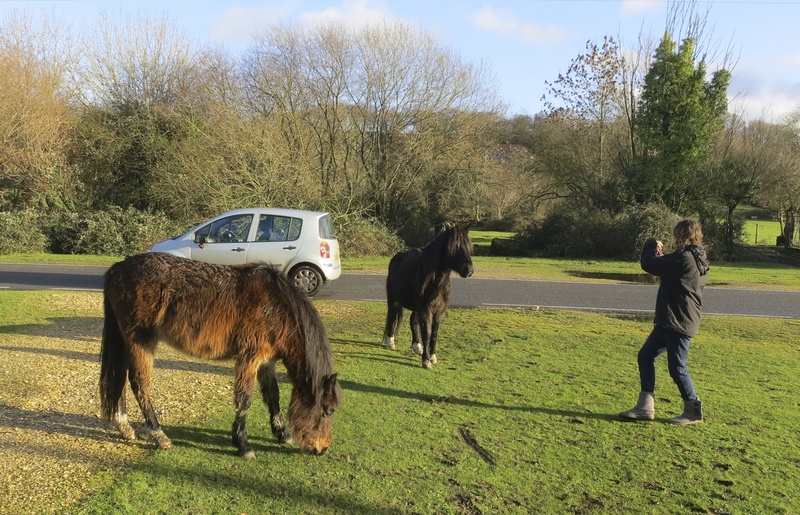 Clearly intended to make the stretch safer for pedestrians, apart from me, Becky and Ian, I have only ever seen Anne, an elderly resident, and strings of ponies use it. Perhaps this is because at times it is difficult to find the gravel under layers of mud and piles of horse manure. One of the uprights of this barrier is currently sporting fungal florets that would probably have excited Tess. 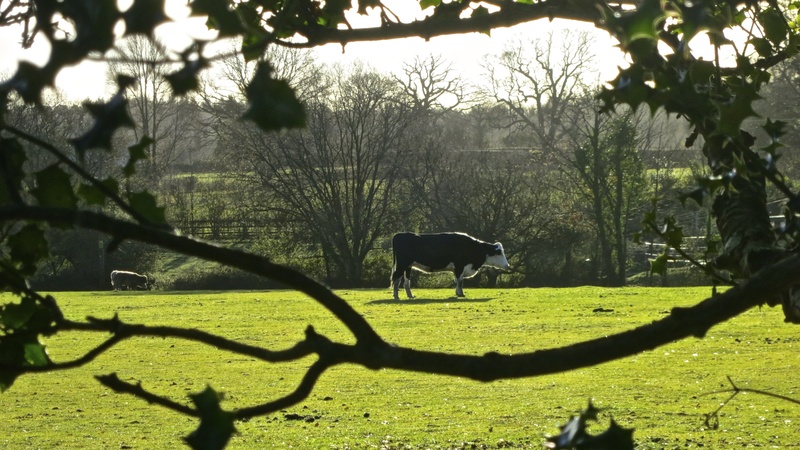 Cattle in the field that lies beside the road leading from the village green to Bull Lane are looking remarkably well-fed. The slow pace of their existence was brought home to me as the sun glinted on the warm clouds of their breath, each one being separated from the next for what seemed a long enough period for rigor mortis to set in. 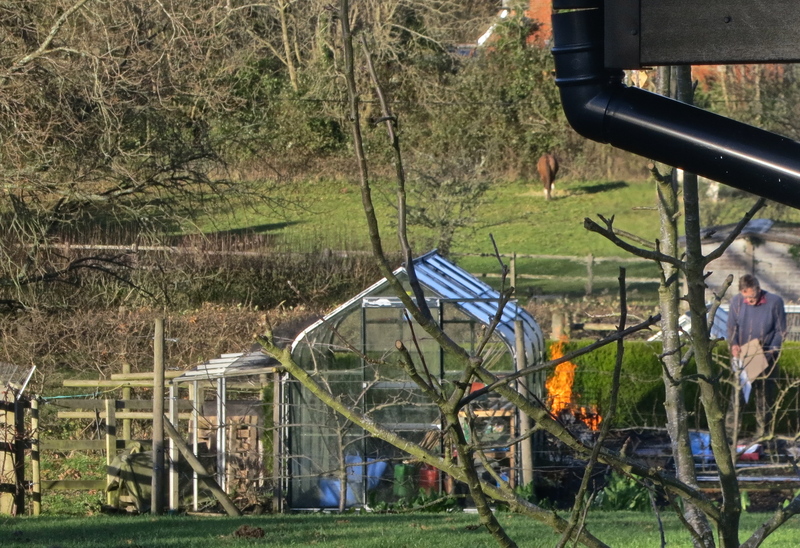 A smoke-free bonfire was being tended just off Bull Lane. For lunch we drove in convoy to West End for lunch at Elizabeth’s, Ian, Becky and Flo following Jackie and me. 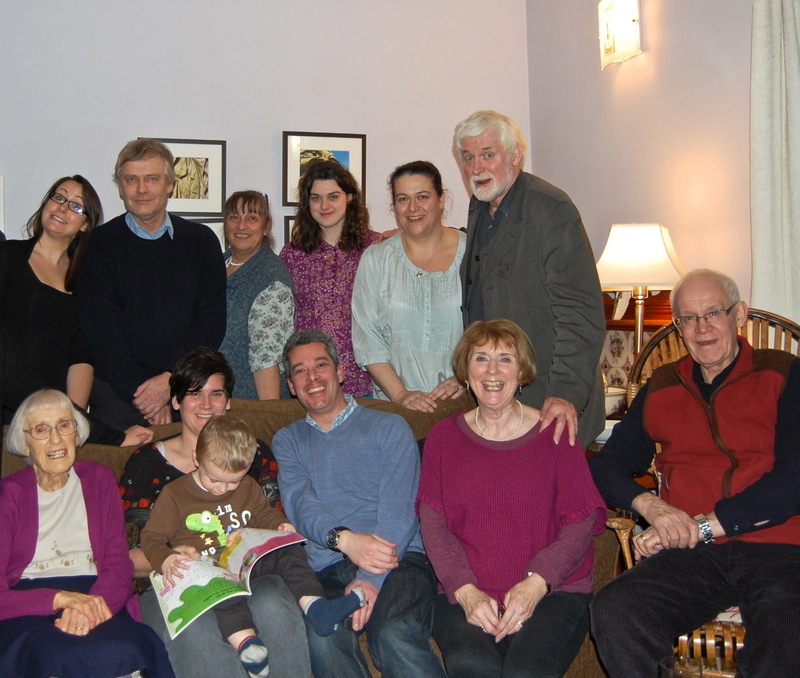 Chris, Frances, Fiona, Paul, James, Mum, Danni, and Andy were all there. 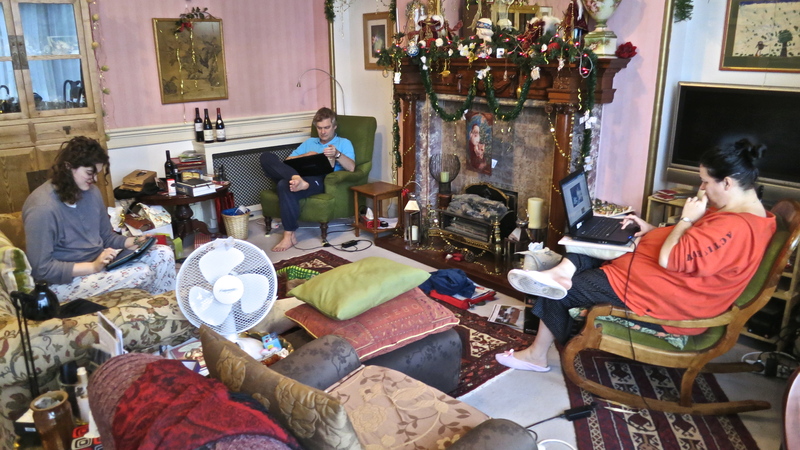 As we collapsed in the sitting room after enjoying a splendid buffet lunch, teas and coffees were produced by Danni, and Paul took a family photo with a timed shutter release. Elizabeth and Andy were both in the picture, but had to be sacrificed for aesthetic reasons. It is notoriously difficult to produce a group photograph where no-one is blinking, pulling a silly face, or obviously totally unprepared. Paul took two shots. Of the two this was the one where most of the family were looking somewhere near their best. One of Jackie’s stoups ( a cross between stew and soup) was enjoyed by the others this evening. Flo and I were still replete from our lunch, and therefore abstained. Mat and Tess went home last night. This morning normal family life was resumed. After lunch Becky had us all screaming with laughter as she continued ‘The Young Visiters’ reading. For those unfamiliar with nine-year-old Daisy Ashford’s 1919 masterpiece it is highly recommended for its juvenile spelling, observation, and hilarious gleanings from adult conversation. It is regarded by many as one of the most humorous works in literature. From her perusal of older blog posts our daughter recognised that Jackie’s pose in Helen’s rugbyfest photograph of 9th March was almost identical to the one in my drawing of her made in 1965. After I’d had an uneventful walk on this comparatively mild afternoon down to the postbox and back, I accompanied Becky, Ian and Scooby on the Seamans Lane/Bull Lane loop. This was to be more eventful for Flo’s little dog, who was to receive his own young visiters (sic). 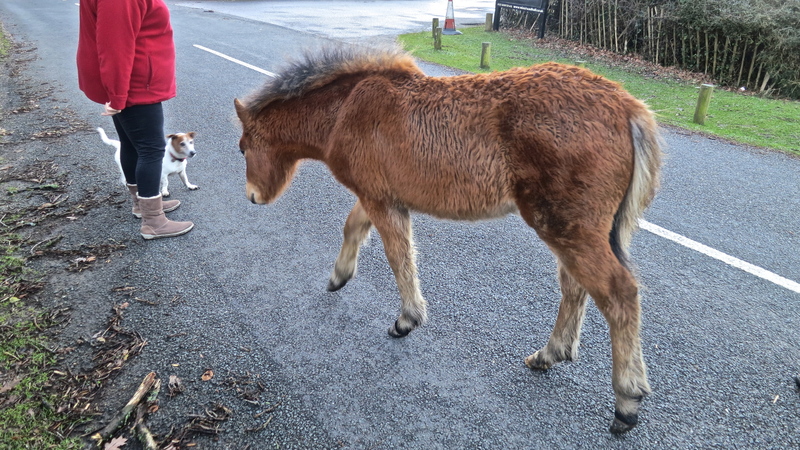 A particularly frisky foal on the road took an interest in Ian, whose sleeve it kept nipping. Ian sought Scooby’s protection. Scooby opted for discretion and conducted the face-off from the safety of the far side of Becky’s legs. These larger animals can really be quite frightening as they quite silently advance upon you. Small dogs obviously feel the same. Earlier, a much larger puppy had rushed out of its garden and attempted to frolic with Scooby, who gave the younger creature a piece of his mind. This was administered with a suitable amount of heroic yapping and snarling. The puppy’s owner had explained that the reason their gate was open was that it was electrically operated and there had been so many power cuts recently they had disconnected it for fear of being unable to get out if the power went down when it was closed. 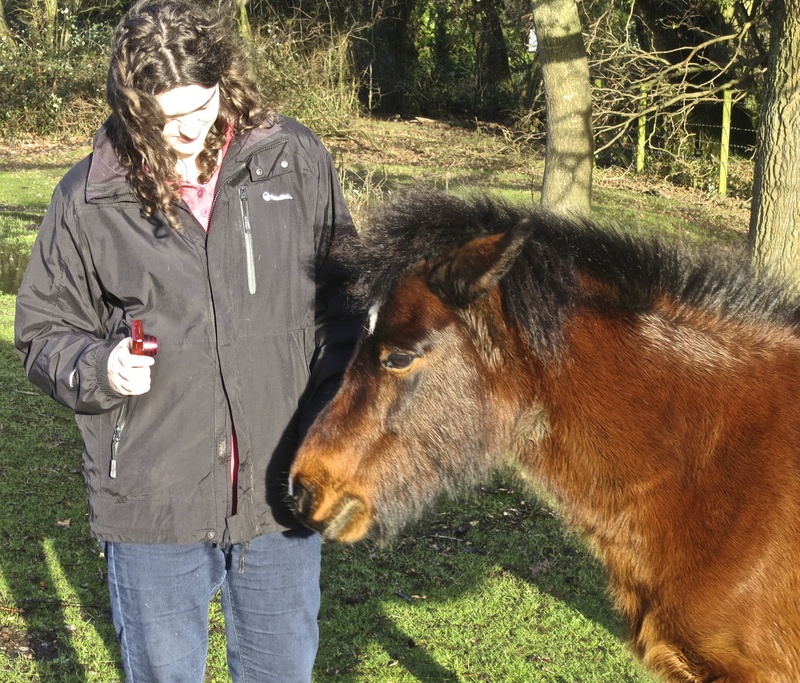 With the pony our hero remained as quiet as that particular young visiter. Our dinner this evening was the symphony in white and cream. Rose and red wines and elderflower cordial were the accompanying drinks. We are now about to settle down to watch The Matrix on TV. 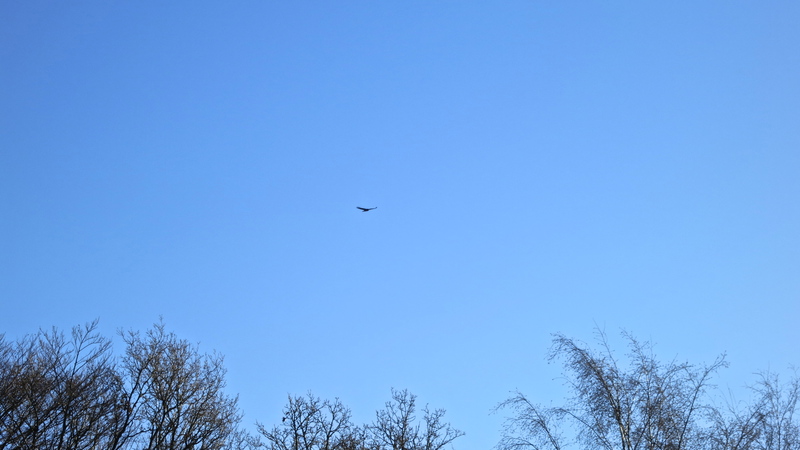 Buzzards circled overhead this morning, causing a certain amount of consternation among the other birds. During the morning I did my best to ignore yesterday’s Dr Who on BBC iPlayer and Eastenders, as everyone enjoyed an after the excitement low-key morning. Matthew has bought Tess a cage and various other accoutrements for Guinea Pigs. It now remains for the little furry animals to be purchased. This involved on-line research and several phone calls resulting in leaving messages, which took me back to another post Christmas search in Newark in about 1990. The night before, one of Sam and Louisa’s pet rats had fled its cage and disappeared upstairs. The poor creature was hunted down and located behind a chest of drawers in Jessica and my daughter’s bedroom. A frantic shoving around of the furniture resulted in a fatal crushing. I took on the task of seeking out a replacement during the holiday period. Off I drove with the children in the car. A pet shop in, I think, Mansfield was found open and with a supply of the required rodents. We chose a white one alleged to be two months old. It looked a little large to me, but we were assured it was just a baby. Back home the new pet was pampered and cosseted. A few days later it was New Year’s Eve. Jessica and I were invited to spend the evening with friends. We did this and engaged our usual baby-sitter. Just after Auld Lang Syne we received a phone call from the teenager we had left in charge at Lindum House. ‘You know your new rat?’, she enquired, ‘Yes’, I replied. ‘Well, it’s just had seven babies’, she announced. Jackie produced another magnificent meal this evening. 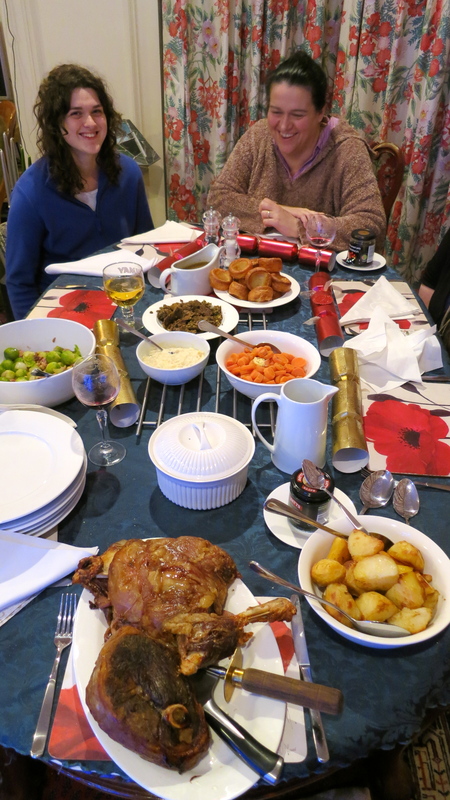 This was delicious roast lamb followed by Christmas pudding. Red and white wines were imbibed, as was Pepsi Max. As he helped his mother clear up in the kitchen after the meal, Matthew began treating us to his rendering of Adam Faith’s masterpiece. Both Mat and his sister knew by heart the words of ‘What Do You Want?’. Neither had ever heard the recording artist who was to become an actor and a successful investor and financial advisor, but they knew just how he sang because they had often ridden in a car driven by me in which they were subjected to my rendering of this and ‘Poor Me’. Mat had given me a copy of his CD for my 70th birthday. I just had to put it on the record player for everyone to have a good laugh over. 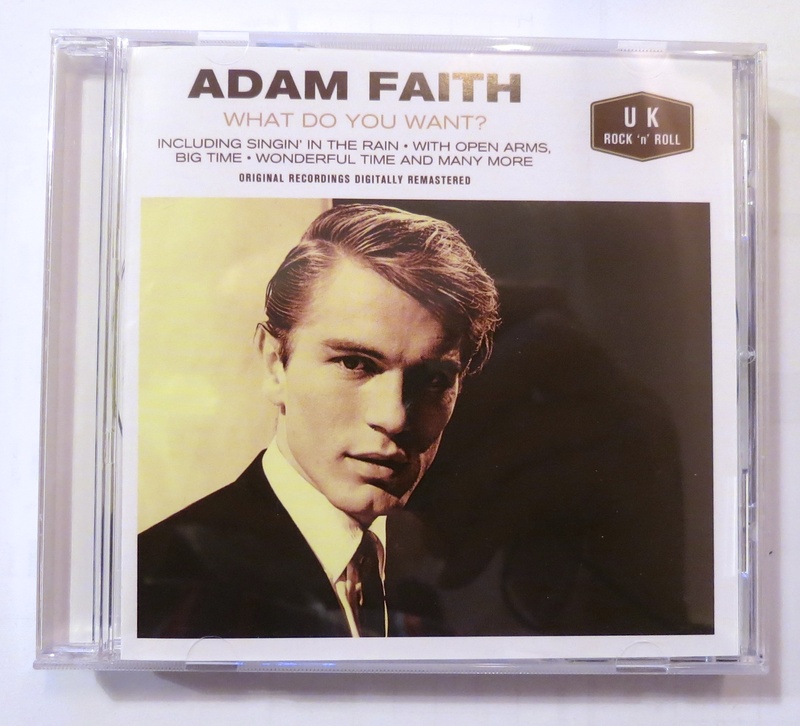 Hearing the original for the first time Matthew and Becky both realised they could sing just like Adam Faith who sang just like their Dad. I don’t think it was the recording artist who was the source of amusement. I rather think it was me. Later, we opened the tree presents. Becky had put one on for Jackie. It was Daisy Ashford’s ‘The Young Visiters’. We then laughed with tears rolling down our faces as Jackie read extracts. Last night’s curry meal was one with which Jackie excelled herself. 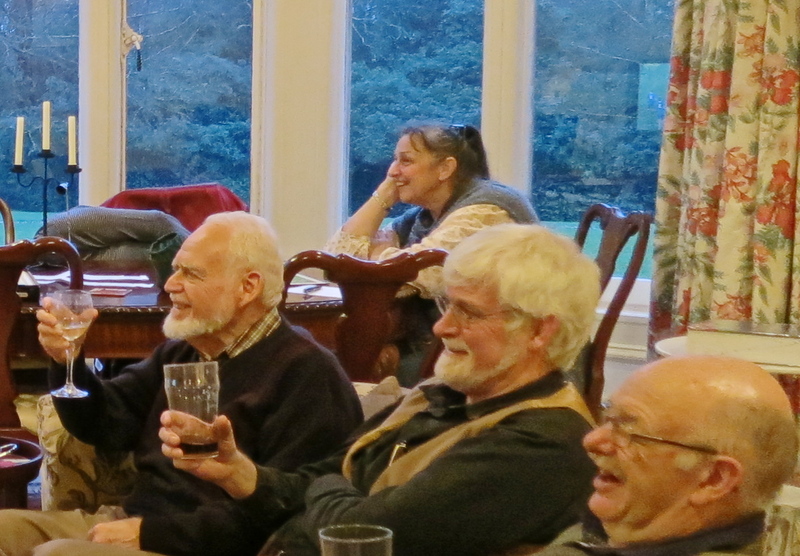 Everyone enjoyed it immensely and we continued talking late into the evening. 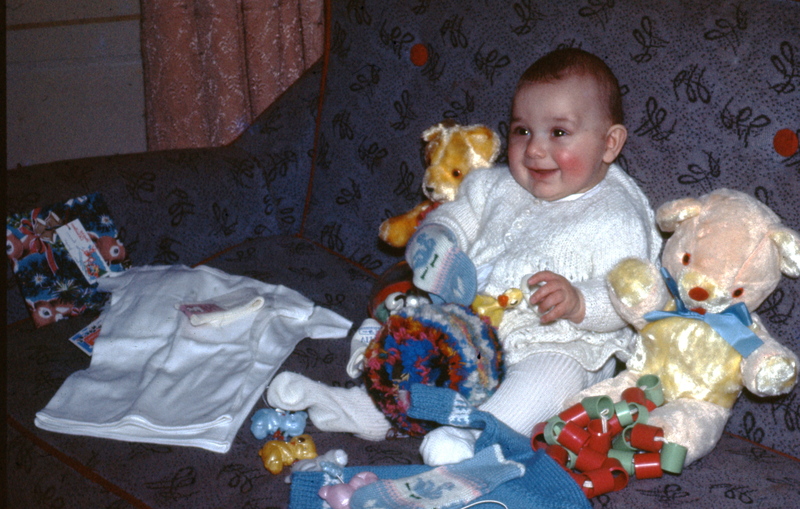 Christmas Day 1965 was my nephew Jimmy Clancy’s first one. In today’s calendar picture he looks pretty happy with his haul of presents. 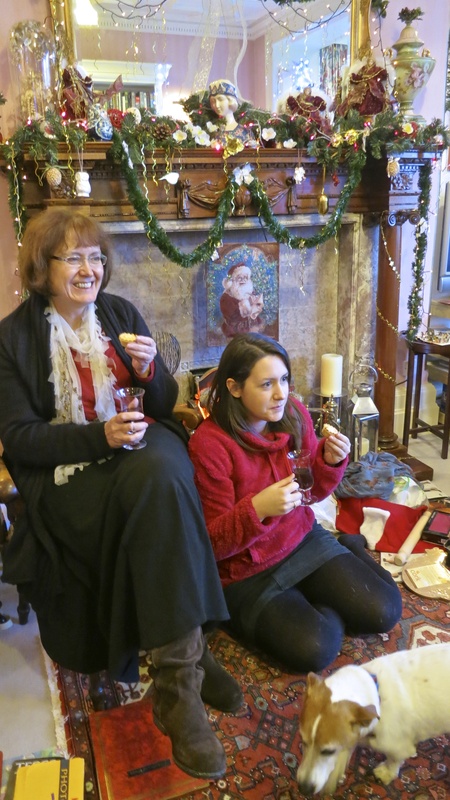 The family rose at unprecedented early hours and we lolled around opening stocking presents and chatting. 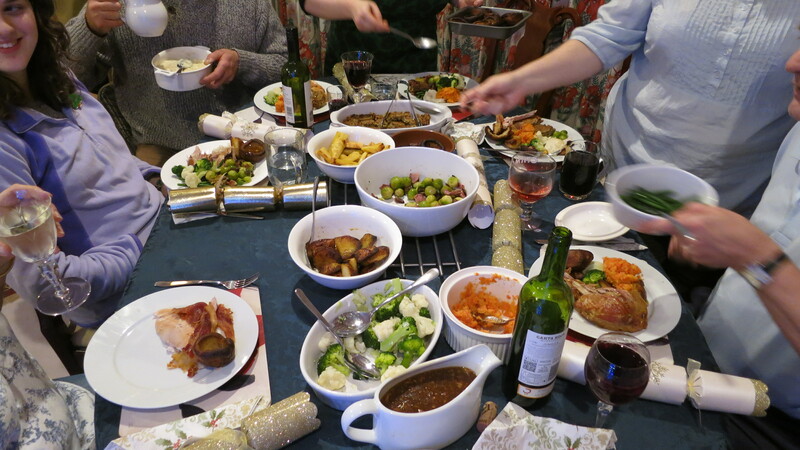 Lunch was a spread that should have rendered no need for the later Christmas dinner. Family banter hotted up. 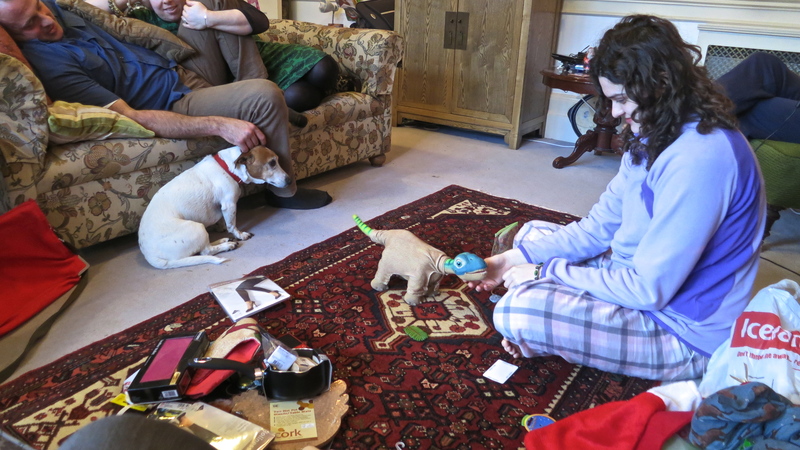 Last Christmas we met Kalu the Pleo. Unfortunately he suffered a terminal illness and had to be replaced by Kota who was undertaking a certain amount of training. Scooby didn’t look all that sure about him. 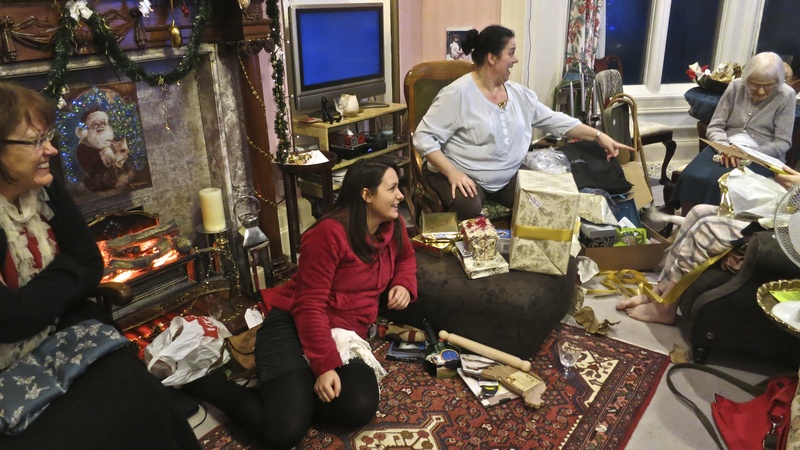 The main present opening was deferred until Elizabeth, Danni, and Mum arrived at 3 p.m. Unfortunately this coincided with the beginning of the Queen’s speech. Jackie disappeared into the kitchen to prepare mulled wine and by the time she realised, our sovereign’s annual presentation to her public was over. I therefore called up last year’s photograph from iPhoto and we made do with that on the iMac screen. 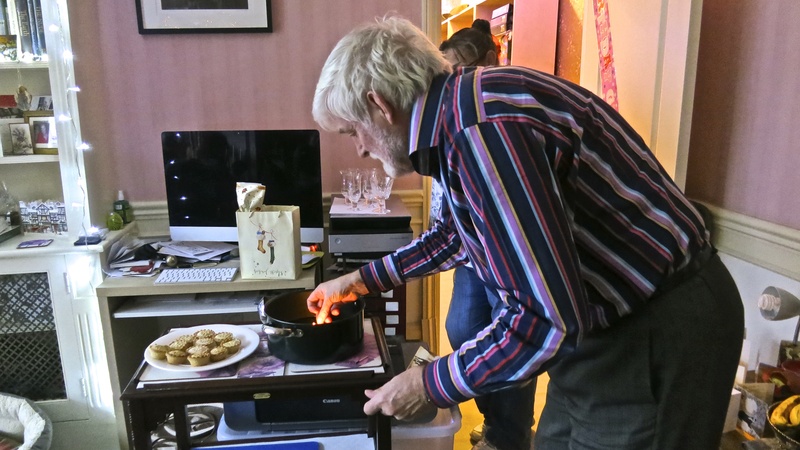 Under instruction, I stood poised with a match to light the brandy on the surface of the wine as Jackie wheeled it in. Maybe I was a little slow in striking and this part of the operation was a failure. Never mind, the wine was fine. 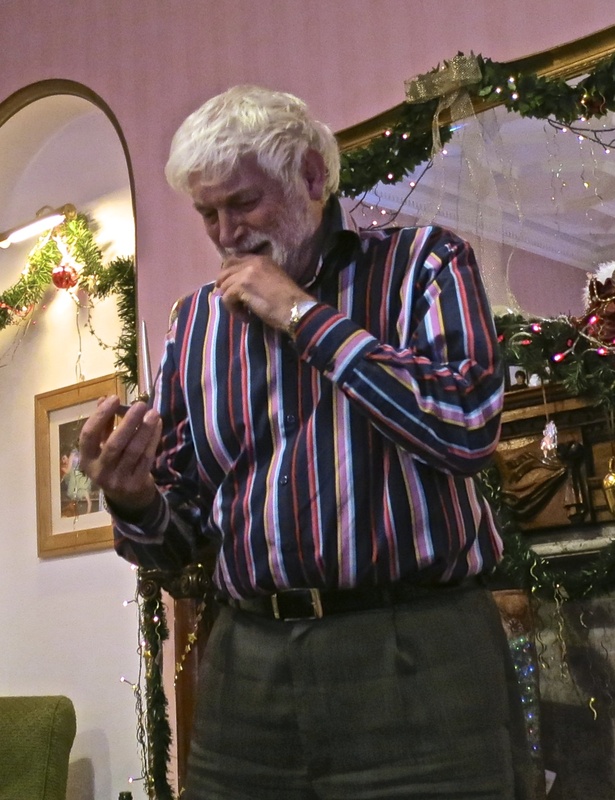 Present opening was, of course, chaotic. Mum managed to keep some sort of track of it. When Becky gave Scooby his from Jackie and me, he ran off with it triumphantly. His wagging tail was all that could be seen of him. It didn’t take him long to kill the squeaky Father Christmas he had been given. 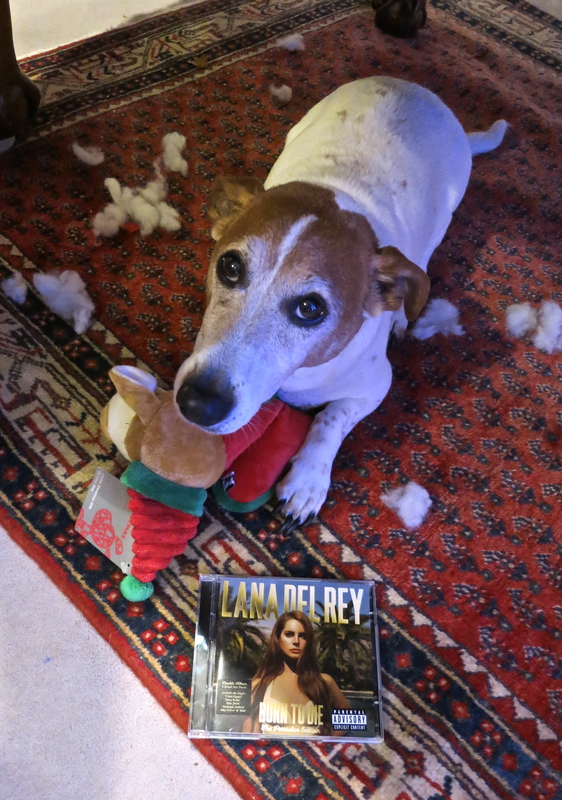 He then sought permission, which was denied, to open Ian’s Lana Del Rey Born To Die CD. It can now be revealed that that CD was the present I had sought on 28th November. The store alongside Bond Street Station where I scored my double six was the relocated HMV. 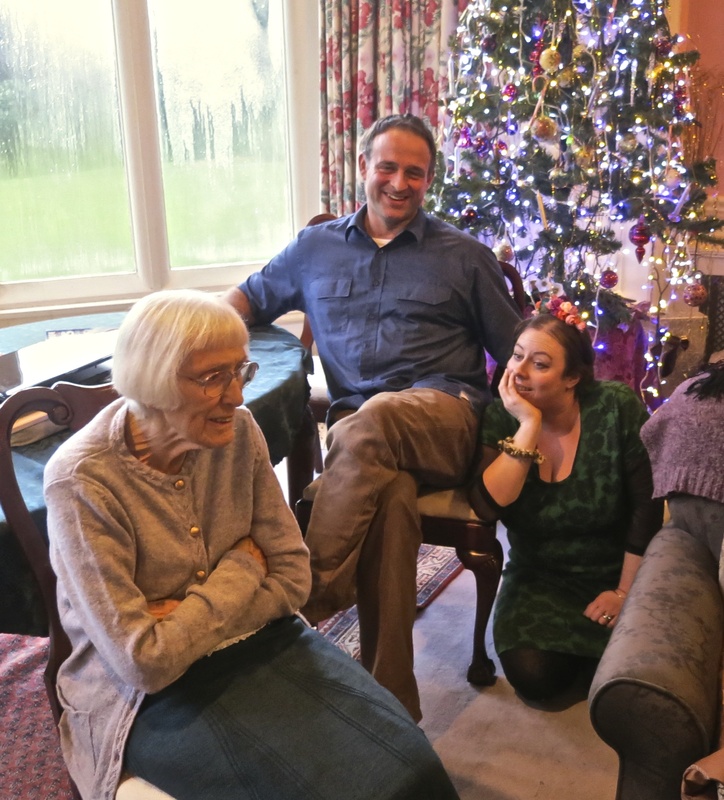 Before Jackie served up a superb Christmas dinner, we played charades. For some reason my effort at portraying ‘Simpsons, the movie’, caused a certain amount of hilarity. Well, I defy any of you to do any better.